These issues have already been subject of previous research including a recently completed doctoral thesis by Volker Helm. 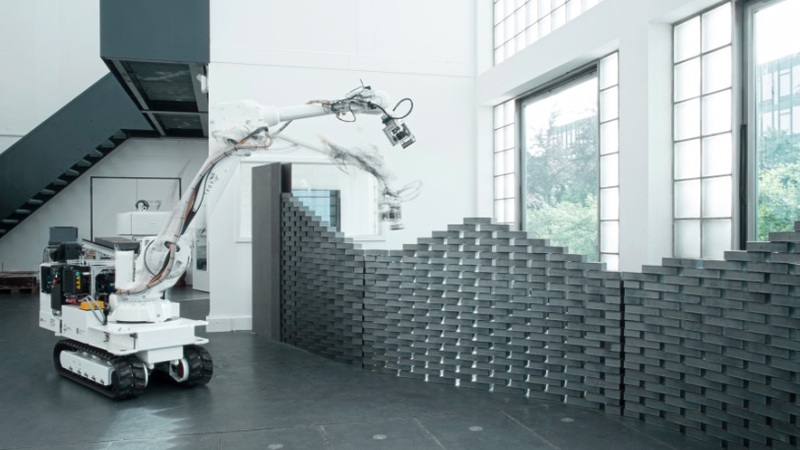 This initial project executed at the Chair of Architecture and Digital Fabrication resulted in the “dimRob” platform; an industrial robot arm mounted on a mobile track system and powered by a diesel engine. The robot was able to move across different terrains, manipulate materials and tools for construction, and was also fitted with a scanning system to manage the construction tolerances. The functioning of “dimRob,” however, still required significant human interaction: The robot had to be driven, stabilized, and localized manually by an operator before being able to build. A new interdisciplinary collaboration will take this robotic platform to the next level, with the long-term goal of transforming the platform into an autonomous robot – the “In-situ Fabricator.” This augmented system will reduce the need for manual input and should be able to accurately build complex structures to millimetre level construction tolerances, while simultaneously being able to deal with the uncertainties of a construction site. Timothy Sandy, PhD student at the Agile & Dexterous Robotics Lab (ADRL), ETH Zurich, explains that “the system should rely solely on on-board sensing and computing.” This is the crucial distinction compared to its precursor and a significant developmental challenge. Together with his colleagues Markus Giftthaler, PhD student at ADRL, and Kathrin Dörfler, PhD student at the Chair of Architecture and Digital Fabrication, Sandy is part of the interdisciplinary project team formed within the NCCR Digital Fabrication. This research initiative, funded by the Swiss National Science Foundation (SNSF), enables interdisciplinary collaborations and projects that individual disciplines are unable to achieve alone. “One of the big challenges in the past month was the development of a precise localisation system”, Kathrin Dörfler explains. This might sound trivial, but how can a mobile robot localize itself when it doesn’t have an external reference point on which to base its coordinate system? A first proof of concept of the localization system was demonstrated in March. The method uses a 2D sweeping laser rangefinder that scans the surroundings to generate a 3D map of its context. This map is then registered against previous scans of the space in order to calculate the robot’s position. 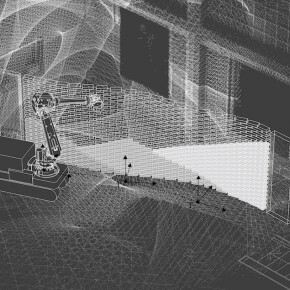 A similar scanning and measuring feedback loop is also used to cope with the tolerances of construction: by comparing the point cloud scans of the existing state of construction to the CAD model of the structure to be built, the robot and its control systems are able to determine any small deviations from design and make adaptions within the construction process. “One of the shortcomings of previous robotic fabrication technologies, is that they are not linked to the design environments of architects,” says Dörfler, explaining the value of this technology to her profession. By linking the CAD systems used by architects with the technologies that build, there is a stronger understanding of what is possible and how to use the technology creatively. All of this sounds as if the “In-situ Fabricator” is ready to go on site tomorrow. However, according to the researchers, the technologies and processes are still “primitive” for now. Sandy explains: “At the moment the robot can be considered to be ‘working in the blind.’” This means that, after having moved, it isn’t aware of its position anymore, and first has to localize itself again. “In future the robot should be continuously aware of its position, even when in motion, and capable of steady, and accurate construction.” Only then will the seamless combination of the digital design with the physical construction process be entirely achieved.